CERTAIN rules must be followed if you want to start an argument with GAA anoraks. Forget the club championship, as it’s a bit like discussing your favourite uncle; nobody has a bad word to say. What about the dominance of the Dubs? Now the Richter Scale begins to rise and there is plenty of noise. The GAA’s pursuit of money is another old reliable. Nowadays, though, you only need to utter five words, ‘the state of Gaelic football’, to set off an avalanche. Nothing exercises the GAA family more these days than how Gaelic football has evolved and changed over the last quarter of a century. Firstly there are the usual arguments from those in denial. They don’t see any problem, even though the facts are staring them in the face. Falling attendances and dropping TV viewing figures for Gaelic football were a significant feature of the 2018 championship. Punters are voting with their feet. They have decided not to attend or watch what they believe has become an unappetising product. 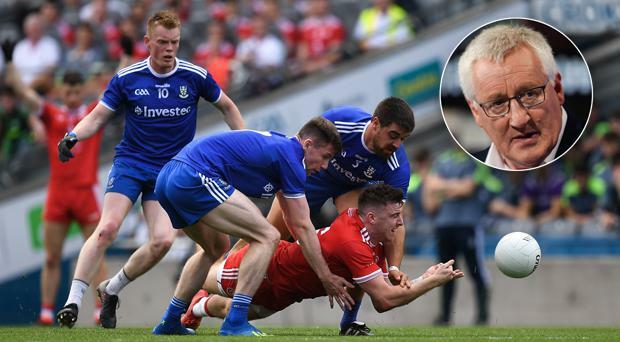 Then, if the likes of yours truly, Joe Brolly or Colm O’Rourke express an opinion, the usual retort is thrown at us: The games were just as bad when we played. Of course there were as many bad games back then; we have never said otherwise. But how come, with more money and time being spent on training and match preparation and players being fitter, faster and more skilful than ever before, the game has actually gotten worse. The key to solving any problem is admitting that a problem exists in the first place. Sadly that is not the case among so many modern-day Gaelic football coaches. There’s plenty of lads who talk about processes and other jargon borrowed from rival sports. They’re the spoofers and bluffers who implement play books – more borrowed sporting jargon – that they have simply adopted from rugby union, basketball and rugby league. As a result we are now witnessing an ugly spectacle of a game which is far removed from the way Gaelic football should be played. So let’s cut through all this nonsense and admit that Gaelic football has a major problem which needs to be addressed. And if the recently announced rule changes make it a better spectacle, I welcome them. As its name suggests, Gaelic football was meant to be about kicking a ball, so anything which restores the primacy of kicking is good. I fail to understand why there has been such a negative response to the changes. For starters, it’s an experiment and we should also remember how rule changes in other codes improved games. The banning of kicked back-passes to goalkeepers had a positive impact on soccer, as had rugby’s prohibition of kicking the ball directly into touch from outside the 22. Likewise, basketball’s introduction of the shot clock proved beneficial. Let’s hope the five proposed changes have a positive impact on Gaelic football in next season’s league. Credit to the GAA, who have at least recognised there are problems and are trying to address them. I fear, however, they are trying too many changes at the same time. Using the league as a field laboratory for these changes is a retrograde step. It will devalue a competition which, in terms of its competitiveness, is arguably better than the All-Ireland championship. In the wake of the GPA kicking up a fuss, the GAA has now said it will review the proposals at January’s Central Council meeting ahead of the start of the league. Don’t be surprised if some of the proposals are dropped, with the ludicrous new kick-out rule likely to be top of the list. My biggest fear, however, is that the country’s top managers will ultimately scupper them. I expect an outpouring of bogus outrage from them between now and the Central Council meeting in late January. Hopefully the GAA won’t panic this time and will stick to their guns. The bottom line is that the rules are not the biggest issue. The elephant in the room is inter-county team managers. They are destroying Gaelic football because of the tactics they favour. Expect them to try and find loopholes in the rule which will enable them to continue with their conservative, cautious, safety-first game plans, where possession is king. These gentlemen are the real enemies of Gaelic football, not the rules. The hand pass has become the bane of Gaelic football. On average there are nearly 400 hand passes per game and the rate of hand passing has grown alarmingly during the last decade. As a result Gaelic football has evolved into a possession based game featuring dozens of either lateral or backward passes, which makes for a woeful spectacle. Opponents of the new rule suggest that referees will have problems counting the number of hand passes, which frankly is a joke. I would have favoured a variation on the new rule by insisting that all hand passes go forward and, as in basketball, once the attacking team move the ball across the halfway line it cannot be carried back into their half. Still, if the change results in a drop in the frequency of hand passes it will have done its job. Here’s an explanation: Players who cleanly catch the ball inside the 45m line can take a mark. The ball must have been kicked from on or beyond the opposing team’s 45m line and travel a minimum of 20 metres without touching the ground. This change is designed to encourage more kicking. Between 2011 and 2017 there was a 15 per cent drop in kick passing, with the average number of kicks per game dropping from 127 to 110 per game. However, I do have reservations. This rule could reduce the fluidity of Gaelic football and make it more like Australian Rules. Secondly, it’s too generous to award a free shot to a player who has caught a ball which may only have travelled 20m. The new rule could also encourage the deployment of the blanket defence in order to prevent opposing players making clean catches. On reflection, I’m not convinced that the introduction of this rule will benefit the game. This change ought to encourage teams to be more positive and result in more contests for possession. Why was it introduced? Simple really – on average, 46 per cent of all sideline kicks were going backwards. In theory it’s a good idea, but really it’s just tinkering around the edges and it’s a pity the committee didn’t also rule that all frees must go forward as well. Delegates at last weekend’s Central Council meeting watered down the original proposal, which envisaged all kick-outs going beyond the 45m line. The idea was to discourage short kick-outs, but this change will hardly achieve that. The amendment destroys the credibility of the original proposal and underlines the dangers of allowing a large committee to have any say in the formulation of rule changes. I understand that the kick-out will still have to go forward at least 10 metres, which at least should rule out the backwards kick-out. The GAA were poised to bring in this rule years ago, but lost their nerve following opposition from high-profile team managers. Arguably this is the pick of the rule changes and I sincerely hope it is made permanent. Basically, the sin bin punishes the player and his team, which is exactly as it should be. The Central Council also decided in principle to back the idea of introducing a second tier championship in football in 2020. The tiered championship has had mixed results in hurling. On the plus side the weaker counties get a day out in Croke Park if they reach the final and they get competitive championship games. On the negative side their competitions suffer from a lack of marketing and at times appear to be a box-ticking exercise. Worryingly, there is little evidence that the lower tier competition has done anything for the weaker counties and there is no sign of a new kid on the block emerging from hurling’s lower regions. To me, there is a need not just for a second football tier, but a third one. However, they would need to be marketed aggressively, with the semi-finals and finals played on the same bill as games in the latter stages of the All-Ireland series and the winners rewarded with a foreign trip.